Recently, I was in one of our bedrooms that we use to store various items – paperwork, old videotapes, cassettes, photo albums, files, my guitar that I haven’t played for like, 10 years…well, you get the idea. Anyways, I turned over a photo frame that was lying on a shelf and found it contained an old black and white (sepia-like) photo. It took me a second to recognize when and where this was from. It was from the early 1980’s and I was staring at a long-forgotten moment in time. The blue belt boy executing the familiar opening move from Heian Nidan is my son, Matt. Way back, some 35 years ago, he was the same age and rank as my grandson, performing the same kata that Noah does today. Talk about Deja Vu! I recall that the pic was taken by a professional newspaper photographer at a community event where Matt and others from the KAH were demonstrating karate. The pic made it into the local community paper and we were eventually able to get a copy of it. I am blessed in that all three of my grandchildren, my daughter, and my daughter-in-law, all currently train in our dojo. I have always been careful not to force my family to practice – a common weakness of sensei’s – often at the risk of having them burn out and quit after a while. Matt began training when he was seven and actually continued off and on until sometime in college, when his increasingly demanding engineering studies and music activities left little time for practice. When training, he was always very earnest and focused and was promoted up to ikkyu (highest brown, just below shodan) before he finally stopped, over twenty years ago. 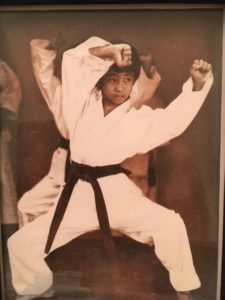 Amazingly – while I had forgotten about the many years that he devoted to karate, just picking up the old photograph immediately brought back old memories. Since his last training so many years ago, he has never entered the dojo again – yet he shares a kinship with you; he can empathize with all of your efforts and challenges in the dojo and he will always keep a life-long familiarity with the art. For each of us, whether it’s planned or unplanned, by choice or forced, there will, indeed, be a last time that we get to train. Knowing that, I have one hope for each member of our group. I hope that no matter how long or short your sojourn is with Karate-Do ends up being, no matter how well you sharpen your skills, no matter what rank you ever achieve….I pray that you carry away fond memories of the many hours you spent in the dojo, striving to improve you mind, body, and spirit. I hope that you retain and always carry in your hearts, nothing but good feelings about the art and about the good people you had the opportunity to train with.